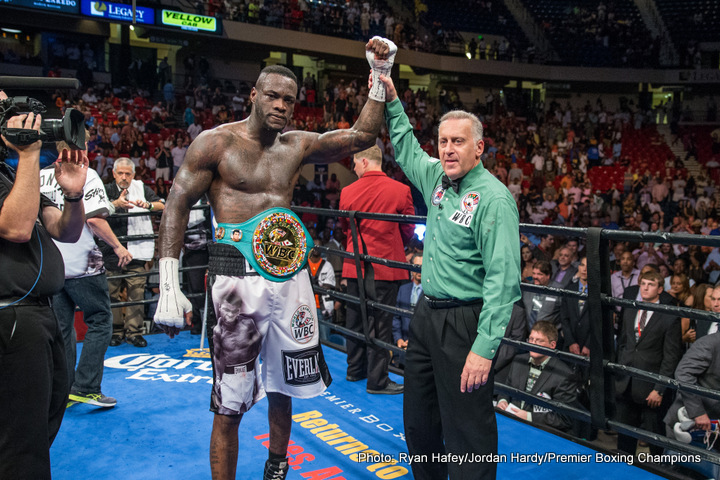 (Photo Credit: Ryan Hafey/Jordan Hardy/Premier Boxing Champions) WBC heavyweight champion Deontay Wilder (37-0, 36 KOs) beat #9 WBC Chris Arreola (36-5-1, 31 KOs) by an 8th round stoppage tonight in their fight on Premier Boxing Champions on Fox Sports from the Legacy arena in Birmingham, Alabama. 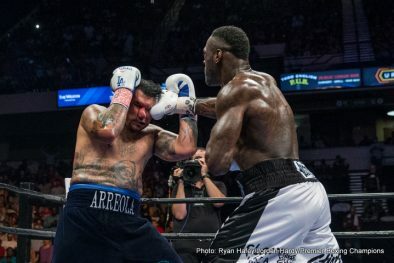 Arreola had taken a pounding from Wilder and his corner decided that he’d had enough after the round ended. 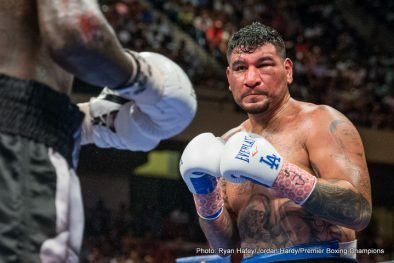 Arreola’s left eye was nearly closed, and he had a cut near the bridge of his nose. 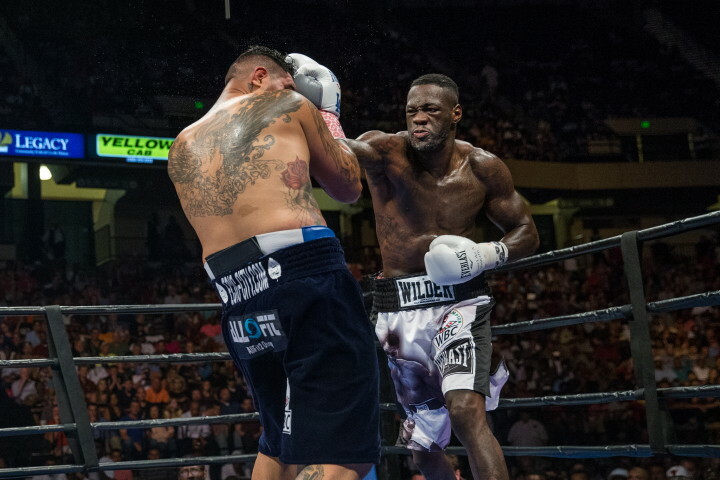 Wilder knocked the 35-year-old Arreola down in the 4th and had him staggering as the round ended. 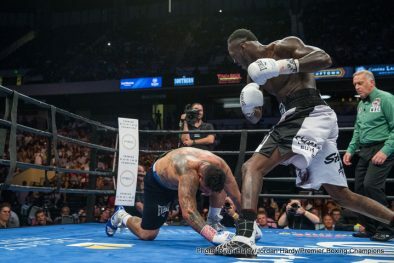 Wilder also had Arreola out on his feet late in the 7th. 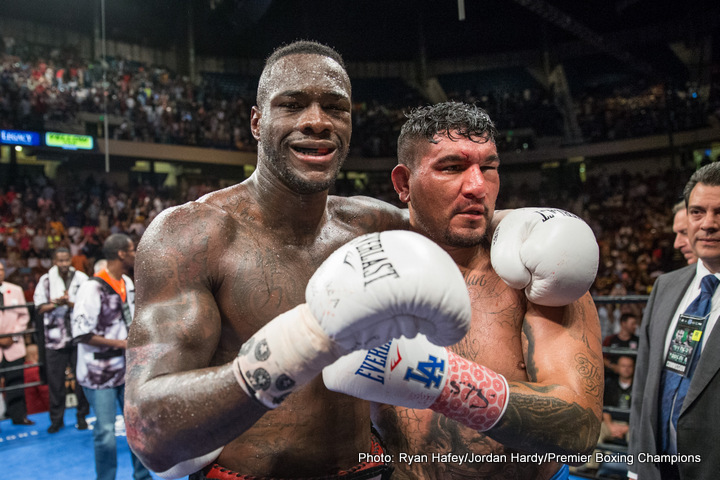 After the fight ended, Wilder said that he had fought with an injured right hand. It’s unclear if he injured it before the fight or during the fight. Never the less, Wilder used his jab mostly in the fight, and the crowd wasn’t too happy about the lack of action. They were booing frequently in the early rounds because neither guy wanted to do anything. 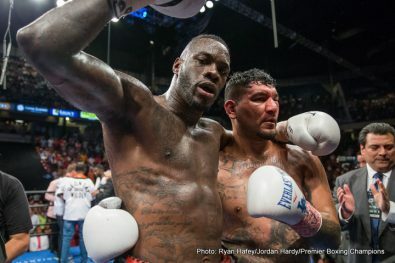 After the fight, Wilder said he was interested in unifying the titles in the division against heavyweight champions Anthony Joshua and Tyson Fury. 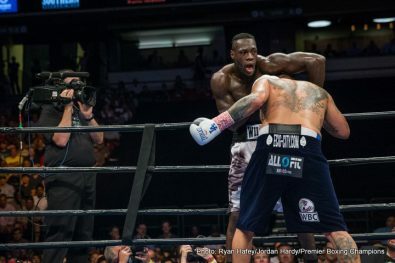 “The question is do they want to fight me,” said Wilder. Wilder didn’t look all that impressive tonight, so I wouldn’t be surprised if Fury and Joshua are licking their chops at the idea of fighting him. 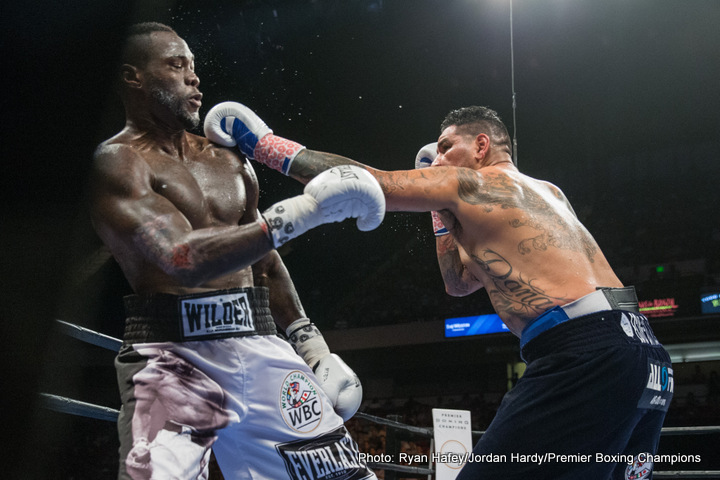 For Wilder, this is the third time he’s suffered a right hand injury since he turned pro. It makes you wonder whether his right hand can take the wear and tear of fighting at the pro level. 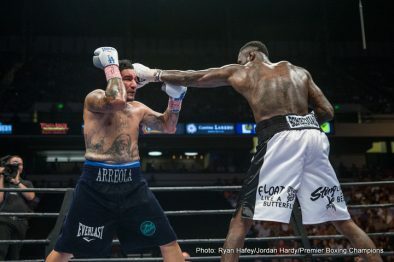 “I have to give him credit for using his distance, using his jab and just keeping me at bay,” Arreola said. 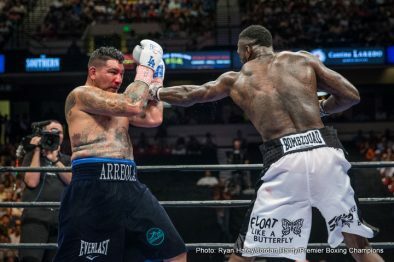 You really can’t buy into Arreola’s excuse about Wilder using his reach to control the fight on the outside, because an intelligent heavyweight would have moved in fast and gotten past the weak slapping jabs that Wilder was throwing. Arreola couldn’t do it because he was using the wrong approach. Instead of moving in quickly the way that Mike Tyson would have during his career, Arreola plodded forward at a snail’s pace with his gloves plastered to his face like a sparring partner. That approach was doomed for failure. 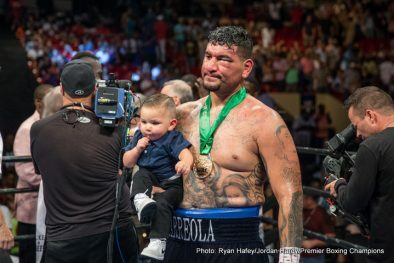 I see that as a training issue, because the trainer should have changed Arreola’s fighting style to adopt a Mike Tyson attacking style to get in punching range. 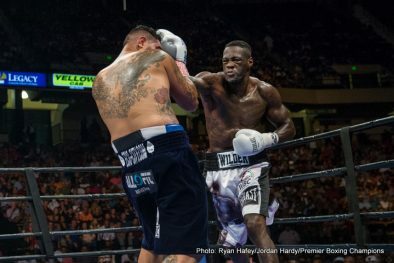 Wilder connected on 152 of 346 punches for a 44% connect percentage, according to Compu-Box’s stats. Arreola landed 52 of 188 punches for a 28% percentage.